Using data from NASA’s Solar Dynamics Observatory and the Hinode spacecraft, researchers reveal that the Sun’s atmosphere has a magnetic field about ten times weaker than a normal fridge magnet. A solar tsunami observed by NASA’s Solar Dynamics Observatory (SDO) and the Japanese Hinode spacecraft has been used to provide the first accurate estimates of the Sun’s magnetic field. Solar tsunamis are produced by enormous explosions in the Sun’s atmosphere called coronal mass ejections (CMEs). As the CME travels out into space, the tsunami travels across the Sun at speeds of up to 1000 kilometers per second. Similar to tsunamis on Earth, the shape of solar tsunamis is changed by the environment through which they move. Just as sound travels faster in water than in air, solar tsunamis have a higher speed in regions of stronger magnetic field. This unique feature allowed the team, led by researchers from UCL’s Mullard Space Science Laboratory, to measure the Sun’s magnetic field. The results are outlined in a paper soon to be published in the journal Solar Physics. Using data obtained using the Extreme ultraviolet Imaging Spectrometer (EIS), a UK-led instrument on the Japanese Hinode spacecraft, the team measured the density of the solar atmosphere through which the tsunami was traveling. The combination of imaging and spectral observations provides a rare opportunity to examine the magnetic field which permeates the Sun’s atmosphere. Visible as loops and other structures in the Sun’s atmosphere, the Sun’s magnetic field is difficult to measure directly and usually has to be estimated using intensive computer simulations. The Hinode spacecraft has three highly sensitive telescopes, which use visible, X-ray and ultraviolet light to examine both slow and rapid changes in the magnetic field. The instruments on Hinode act like a microscope to track how the magnetic field around sunspots is generated, shapes itself, and then fades away. These results show just how sensitive these instruments can be, measuring magnetic fields that were previously thought too weak to detect. 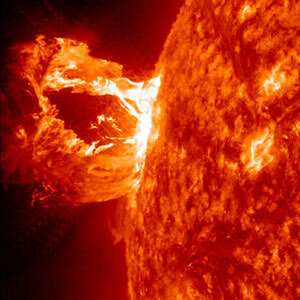 The explosions that produce solar tsunamis can send CMEs hurtling towards the Earth. Although protected by its own magnetic field, the Earth is vulnerable to these solar storms as they can adversely affect satellites and technological infrastructure. Be the first to comment on "Sun’s Magnetic Field Weaker Than a Normal Fridge Magnet"